I was so pleased to die cut the very thick American Crafts glitter cardstock with the In a Word: Joy cutaway ... cutting it 108 times no less! Here they all are in stacks of 10. Here you can see how the "JOY" sticks out. 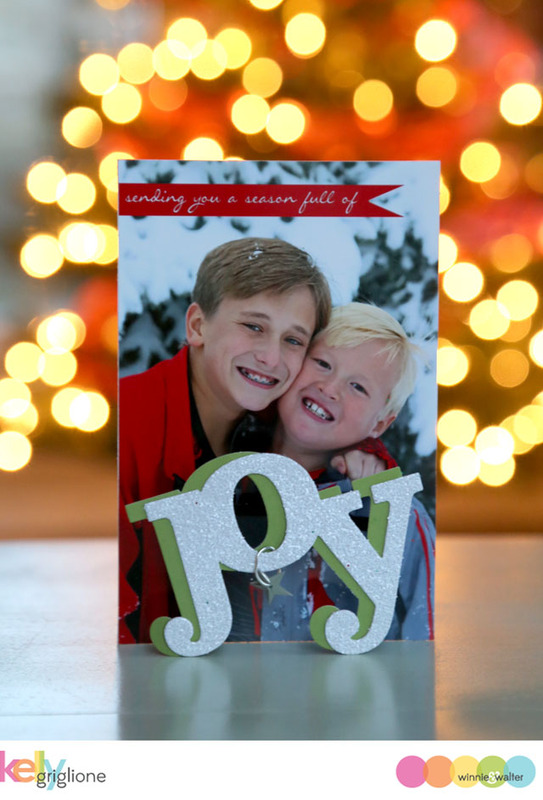 There is a thin strip of black cardstock folded in a rectangle adhered to the front of the photo and the back of the "JOY." 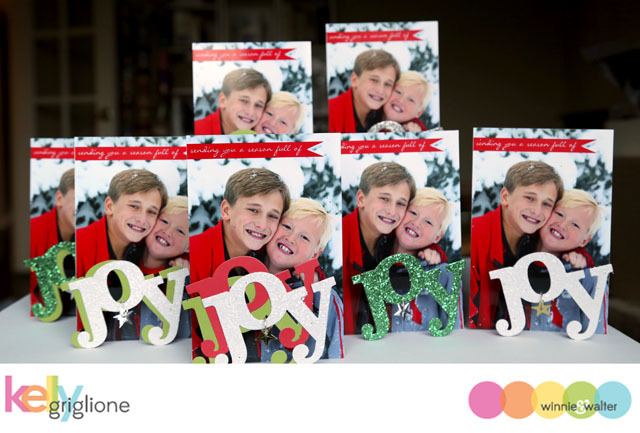 This allows the "JOY" to be folded flat for mailing, and once the recipient opens the card, the "JOY" can swing out. It then becomes the stand to hold the photo upright. You may also notice a star charm hanging from a silver jump ring looped through the "O." I really like how the swinging star catches the light and gives a sense of movement when you open the card. I made a few different versions with different colors of glitter paper, and multiple layers of "JOY" cuts. Here they all are, waiting to be put in envelopes. The ones on the left are all standing. The ones on the right are not. You may wonder why they are not standing. Think dominoes. Any breeze from children running by made keeping things on the table very frustrating! Thanks so much for looking! I sincerely hope you have "a season full of joy" regardless of which holidays you celebrate! yay!!!!!!!! Aren't these fabulous? All the details that Kelly does on her projects....amazing. Wow! 108 times? That's a lot of joy!!! WOW... this is stunning!!!!! 108 times cranking? I have Silhouette and I will let my Silhouette do that for me LOL! Oh Kelly, here I am again, but I just cannot get enough of this joy!!! 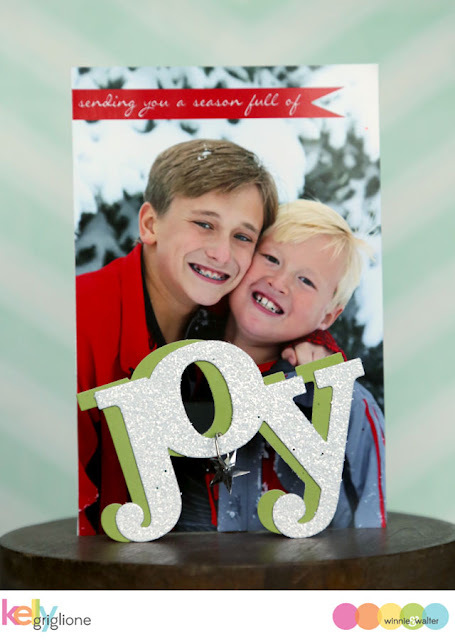 Love the darling photo and the sentiment layering....pure joy indeed! WOW - your photo cards are DELIGHFTFUL and FILLED with JOY Kelly!!! LOVE your CLEVER way of using the sentiment to stand it up too => THANK YOU for sharing your CREATIVE INSPIRATION!!! Talk about impressive! You've added the 'perfect' sentiment to the fabulous photo of your guys! Joy, indeed...oodles and oodles of joy!